High-tech, brilliant and just plain bizarre, these 31 rings aren’t exactly your standard precious gemstone set in a valuable metal band. 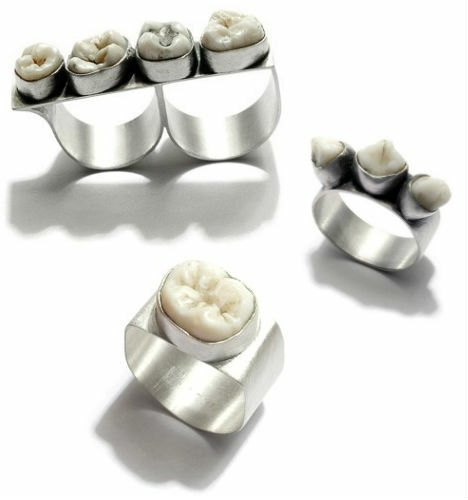 Sterilized human teeth, living plants, replicas of food and creepily realistic representations of body parts challenge notions of beauty in jewelry while tiny projectors, pillows, books and programmed end dates provide unusual functions. 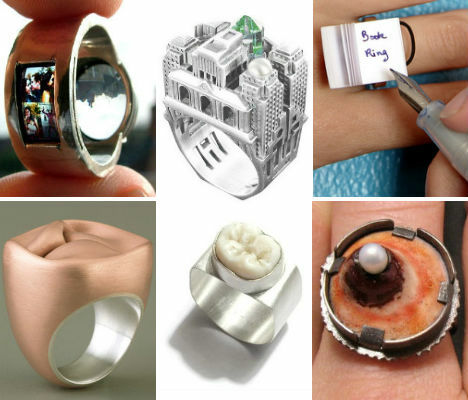 In a darkened room, shine a light through this incredible one-of-a-kind ring by Luke Jerram and jeweler Tamrakar and it will project a selection of miniature slides onto a surface like a wall or a piece of paper. 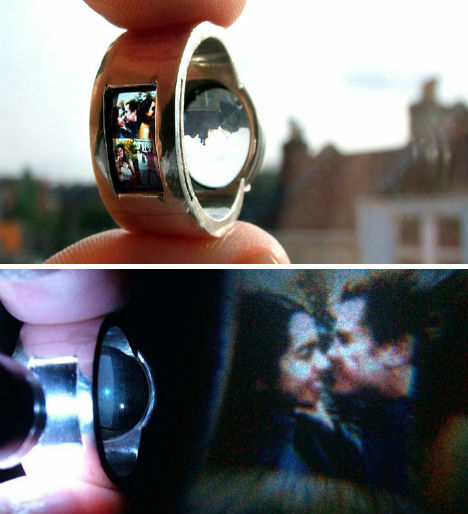 Jerram, who created it as a wedding ring for his own wife, explains, “The ring was my first prototype and was made by hacking apart disposal cameras to find the right lens I needed.” Unfortunately, the ring was stolen, but Jerram replaced it with an equally beautiful and unusual ring. The Talking Ring has a 20 second recorded message – Jerram’s proposal – etched onto its surface. The message can be played back with a miniature record player. They look like simple, colorful plastic rings, but they’re even more fun than that. 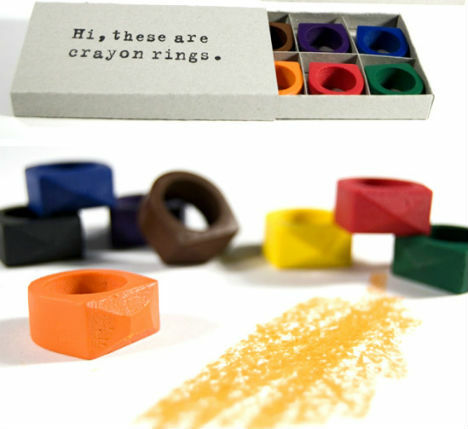 Brooklyn-based designer Timothy Liles produced these ‘crayon rings’, which are actual functioning washable crayons sold in packs of eight. 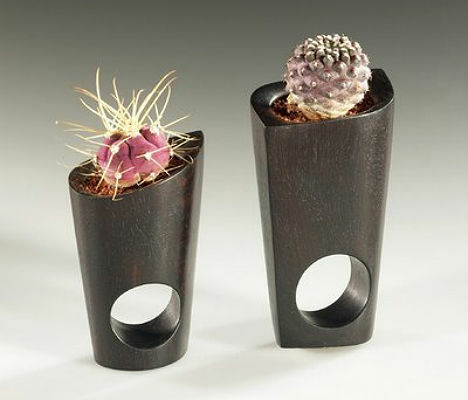 These organic rings by Barbara Uderzo are planters in which beautiful, prickly succulents are planted. They’d certainly make a punch more painful. Have you ever rested your head on your hand only to find that your knuckles are uncomfortably sharp? No? 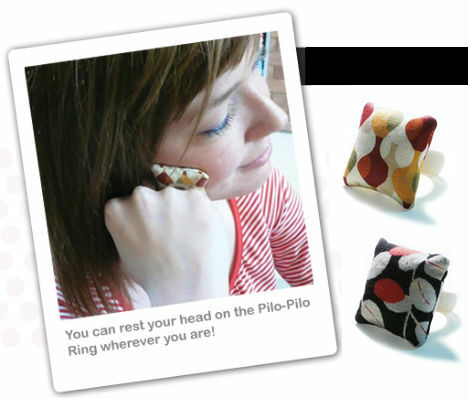 Well, the makers of the Pilo-Pilo Ring think that you could use some extra padding when you’re “thinking, daydreaming… falling asleep” or perhaps some comfort “when you got stood up on a date.” So basically, it’s like a miniature boyfriend pillow? This concept by Charles Widlin holds 1,400 magnetic spheres which rotate into place according to micro computer circuitry, displaying letters or numbers without the use of LCD screens. 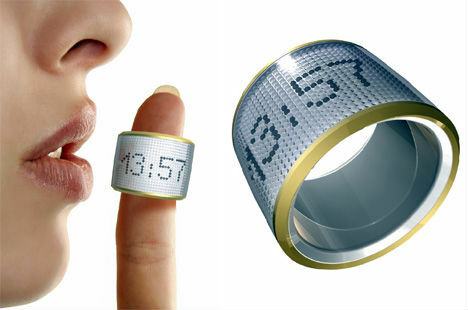 Widlin imagines that the Digitus Ring could be used to display the time, or an important date. This is more than just jewelry – it’s a wearable sculpture. Alidra Alic creates stunningly complex floral jewelry created using a plastic technique in conjunction with sterling silver and semi-precious gemstones. “Furthermore I work with themes of illusion and lack of function in order to awake my viewers’ curiosity and to show jewelry in new value contexts,” says the artist. 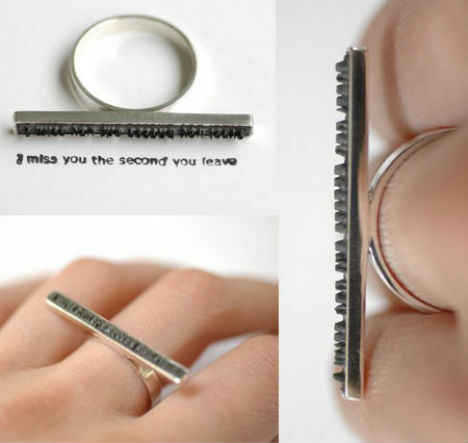 Leave a loved one a special message whenever the mood strikes with one of jeweler Colleen Baran’s ‘Love Letter’ Rings, which print messages like ‘I miss you the second you leave’ when use with water-based inks. 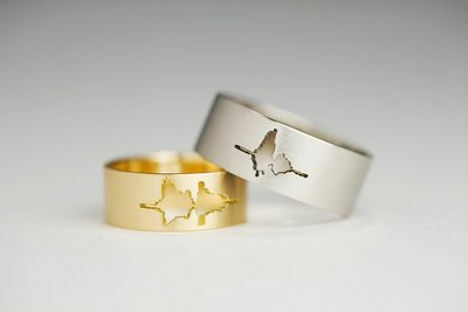 Preserve your words in a highly unusual piece of jewelry with Sakura Koshimizu’s Sound Wave wedding bands. The artist turns a short sound clip into sound waves which are laser-etched into gold, silver or steel. No, it’s not a ring that you put in a navel piercing – it’s a disturbingly realistic recreation of a naval, on a ring. Metalsmith Yuyen Chang has designed an entire line of ‘orifice jewelry’ including brooches and pendants, in case you’re eager to buy a matching set. If you buy the Remember Ring, you’ll never forget your anniversary again – because your finger will gradually get hotter and hotter until you’re physically uncomfortable. The ring uses a ‘micro thermopile’ to convert the heat from your hand into electricity. You specify your anniversary date, which is programmed into the ring. 24 hours before your special day, the ring will gradually heat up, “but not hot enough to burn,” so say the jewelers. Wear your love for architecture on your finger with platinum or gold diamond rings shaped like buildings. 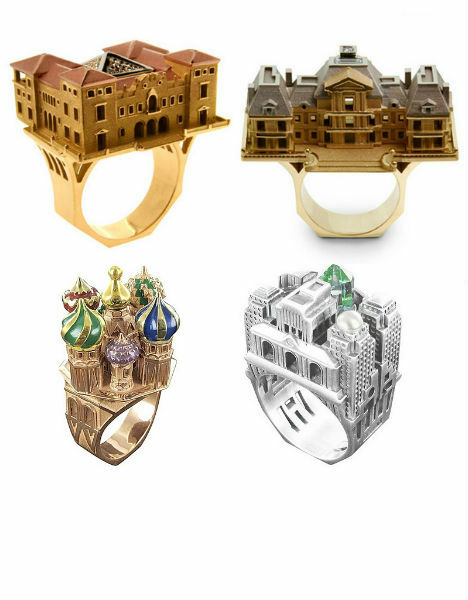 Parisian jeweler Philippe Tournaire recreates structures from around the world including his home city, Moscow, New York and more, and has even made replicas of entire city blocks. 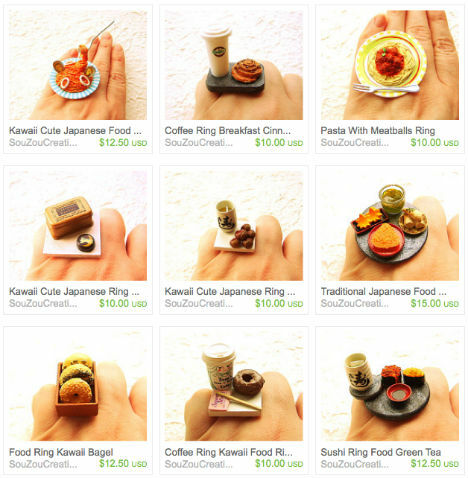 As if you needed another reason to daydream about lunch until noon rolls around, these rings by SouZou Creations will have you salivating over cupcakes, pizza, spaghetti and pie. These quirky kawaii-style creations made of plastic, glass, metal and ceramic are the work of Sofia, a Canadian living in Japan. Ever wish you always had some paper at your fingertips, so you could write things down whenever the mood strikes, no matter where you are? 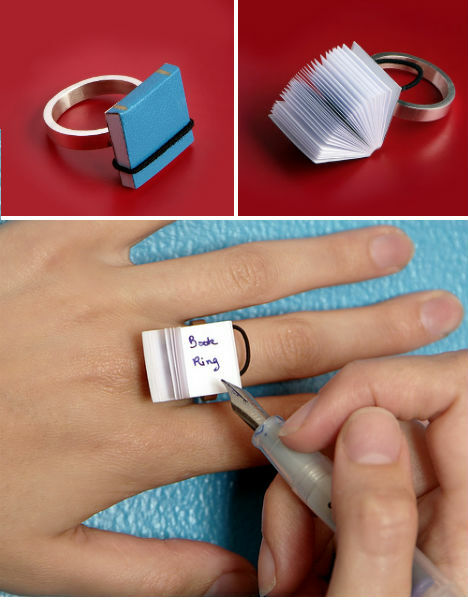 This miniature notebook ring by Ana Cardim makes that possible, though you’ll have to think of another way to carry a pen. Pimple Popper – Grossest Ring Ever? Who hasn’t looked down at their finger and wished that what they saw there was a disgusting pustule about to pop? 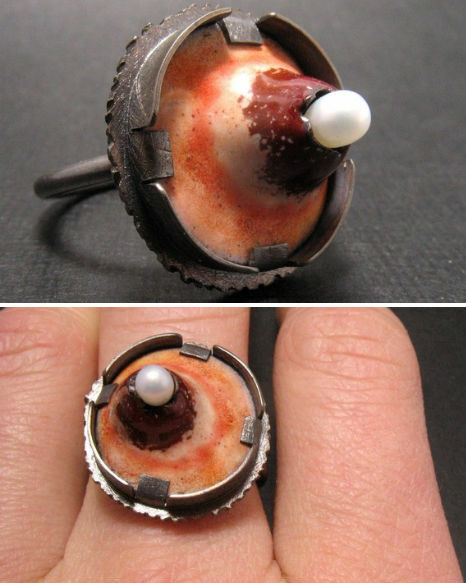 An Etsy seller called ArtbyWinona makes that dream (or nightmare, depending on your perspective) come true with this ring made of sterling silver, freshwater pearl, copper and enamel. Says the artist, “I am just going to come out and say it…..I like popping pimples, zits, black heads, white heads, you name it I like to pick at it! Disgusting I know, but I have a feeling I am not alone. I am just one of the few that will admit it and come out of the closet."